A home emergency is stressful – a burst water pipe, being locked out of the house, a fridge that suddenly stops working. The inconvenience and unexpected costs all add to an already tense situation. 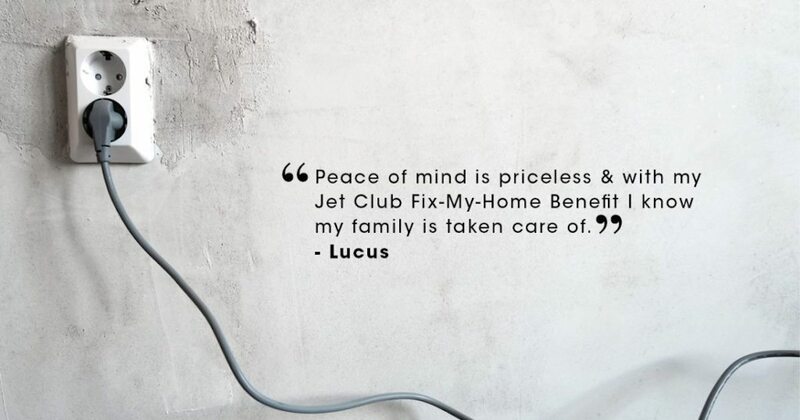 Just let Jet Club’s Fix-My-Home benefit handle it. Just call our call centre and professional, affordable help will arrive within two hours. You can phone for an electrician, plumber, locksmith, glazier or someone to repair an essential appliance. The cost includes the call-out fee and the first hour of labour. You just pay for any parts. You can use the service for three events per calendar year. You can also get assistance for repairs that aren’t an emergency. For these you settle directly with the service provider at repair time. Replacing of damaged locks – you will be assisted at your own expense. The cutting or replacement of keys or door locks.